Hatch came to us for solutions. First they needed a way to provide collateral at worldwide events without printing all their publications. Then they wanted a way to celebrate the history and success of their global brand with an interactive timeline they could use in their new lobby and other offices around the world. Our Toronto design studio delivered! Swerve designed and built a PDF collateral site for Hatch. 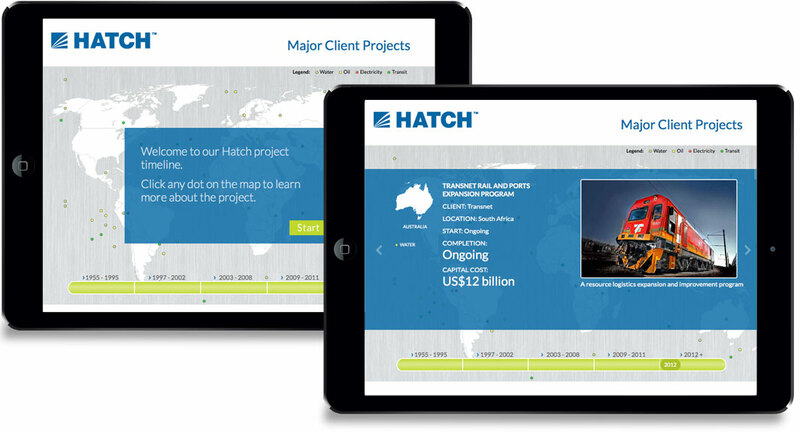 When Hatch has an event anywhere in the world they would hand out several brochures and books on their specialized services. They found many users would not take them or if they did, they wouldn’t often keep them because it would fill their suitcase or be too heavy to carry a stack of booklets around. So we solved this challenge through a website design where a user could browse through their vast collection of marketing materials and select brochures they wanted and simply email a PDF to their email address so when they arrived back home they could download the brochures. 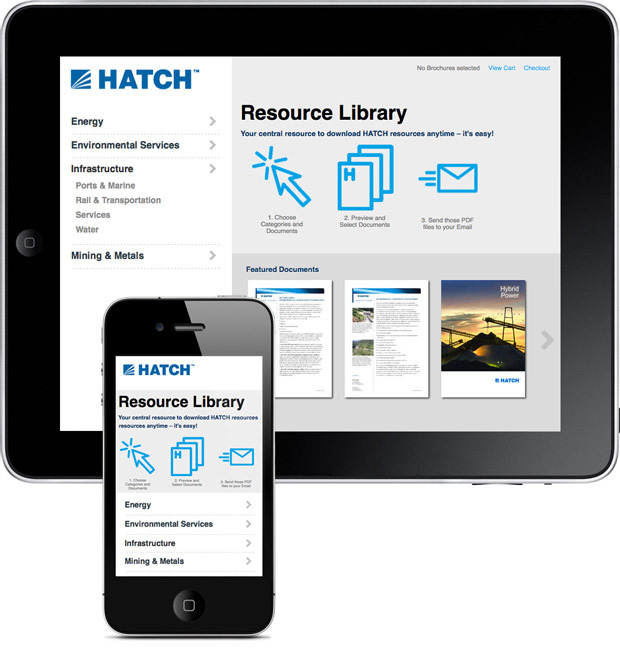 Hatch now brings iPads to their events and allows users to send themselves the materials, or users can use their own mobile devices at any time to view the collection, preview the brochures and send it to their email for viewing at a later time. This also allows Hatch to collect data on the users and gives them the opportunity to opt-in for other online communications. We were also tasked to create an interactive timeline to celebrate the history and milestones of the company. This timeline was intended to be displayed in the lobby of a new office building and using a huge touchscreen the viewer can interact with it.